The number of unmanned aerial vehicles (UAVs) operated by the Russian armed forces has risen from 180 in 2011 to more than 2,000 today, according to the country's defense minister Sergei Shoigu. Three types are known to have been operated over Syria, although none are apparently armed, so that all of the 1,760 Russian combat missions/5,682 airstrikes performed in the area of hostilities during January and February were by manned MiG, Sukhoi, and Tupolev aircraft. The three types includes two domestically produced UAVs and a licensed copy of the IAI Searcher Mk II from Israel. Shoigu told the Russian parliament that the army today operates 600 modern UAVs compared with most of the systems in service six years ago that were “outdated pilotless flying vehicles.” Last year 38 more military UAV operating units were established. They include two with the paratrooper force and an unspecified number with Russian special forces that use UAVs for discovering terrorists’ infrastructure and movements and for precise targeting for strike aircraft. The most widely used UAV in Syria is the Eleron system employing an Eleron-3SV flight vehicle with a single pushing propeller. Weighing four kilograms (8.8 pounds), it can fly at altitudes between 50 and 5,000 meters (164 to 16,400 feet), following a preprogrammed trajectory or being directed via commands from the ground. Mission equipment is relatively simple 10x optical payload. Another popular system is the Orlan (also referred to as Leer) employing a 18-kg (39.7 pounds) Orlan-10 vehicle with a tractor propeller. Unlike the rather simple Eleron-3, it carries a gyro-stabilized platform for sensors that include high-resolution electro-optics. The Orlan can operate at night and in adverse weather conditions, typically loitering at height of 5,000 meters for up to 16 hours. For uninterrupted transfer of images in real time, the UAV should stray no more than 120 km (75 miles) from its base. But in an autonomous mode, the Orlan-10 can operate 600 km(373 miles) off-base following a preprogrammed trajectory. The third type in Syria is the 454-kg Forpost, the licensed copy of the IAI Searcher Mk II. Russia has been a customer of UAVs from Israel since 2008, when it acquired a small number and used them during the war with Georgia. In 2009, Russia formally purchased 12 IAI BirdEye-400, I-View Mk150 and Searcher II systems for $53 million. Later, it placed follow-on orders for 36 and 15 more systems worth $150 million. A licensed production agreement followed in October 2010. Russia began using imported parts in 2012, and proceeded with gradual localization of airframe parts and mission equipment. 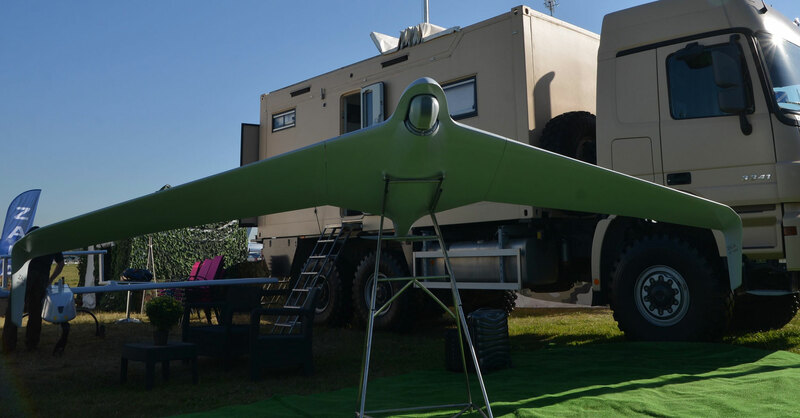 Meanwhile, in 2011 the Russian defense ministry placed an order worth nine billion roubles for 10 more Searcher systems each consisting of three UAV and a control station. Russia also procured 27 Zastava systems—a licensed copy of IAI BirdEye 400—for 1.34 billion roubles ($22.7 million). Recent photos from Syria reveal that the Zala-421-16 has been deployed there. This dual-purpose system developed within Russia became operational in 2014, first with the Ministry for Emergencies as a means of land surveillance. It was later accepted by the armed forces. The air vehicle weights between 8 and 11 kg (17.6 to 24.3 pounds); flies at altitudes of up to 3,600 meters (11,811 feet); and loiters at speeds up to 110 km/h (59 kts). It is interesting to note that Russian state arms exporting agency Rosoboronexport has recently stated that the Orlan, Eleron and Zala-426-16 are combat-proved and internationally competitive, so that they have the potential to fill a distinct niche in the global market for such equipment. At the same time, the appearance of a Russian UCAV in Syria has long been expected, as the civil war there provides a suitable environment for assessment of new combat systems. Shoigu said that a total of 162 types of new and upgraded systems have been combat tested in Syria, of which only 10 systems did not meet expectations. “Orders for them have been cancelled or suspended until manufacturers prove their characteristics are up to advertised performance,” the minister explained.